I’m using my MacBook Pro (OS X 10.6) standing in a shelf with an external screen on my desk so I don’t use and need the internal screen. But if the internal one is on it’s shown in spaces. It is possible to use the MacBook with the internal screen switched off by putting it to sleep and wake it with an external input device while the Book is close. But this way always needs a short sleep and interrupt working. So I wonder if it’s is possible to switch off only the internal screen by software (an app, via Terminal, AppleScript, a keyboard short cut etc.) without switch off the external screen? I know that there’s a shortcut for “sleep screen“ but this affects all screens including the external one. If a laptop is connected to an external display, closing the lid doesn't put the laptop to sleep. If you open the lid after that, the internal display is turned back on. sudo nvram boot-args=iog=0x0 restores the behavior in 10.6 and earlier. If others were looking for a way to trigger normal display sleep (like when pressing ⌃⇧⏏), you can use SleepDisplay. If I understand it correctly, you want to only be using your external display and have the internal display to be shut off. 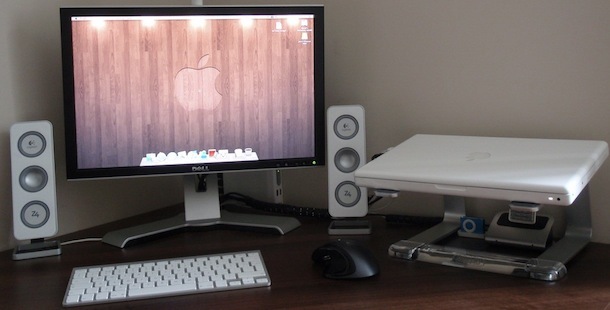 To achieve this, you want to put your macbook in clamshell mode. c) external keyboard + mouse. Then all you do is close the lid (see pic below). When you want to put your mac to sleep you press opt+cmd+eject, and when you want to turn it on again you press any key on your wireless keyboard, having your macbook closed at all times. You know, you could just put the laptop into display mirror mode instead.... Just turn the brightness all the way off on the laptop display. While I haven't been able to find a command that will sleep the display natively, there is an app you download that will do it. There are two options from here. Right click on the app from the Downloads folder and click "Show Package Contents". Navigate to Contents/MacOS and copy the sleepdisplay file. Navigate to /usr/bin (you can use the ⇧+⌘+G shortcut and type the directory in) and paste the binary file. You will now be able to type the command sleepdisplay into Terminal or through SSH and the display will immediately go to sleep. Not the answer you're looking for? Browse other questions tagged macos snow-leopard hardware screen . Put Macbook Pro to sleep with HDMI connected to External Monitor? Automatically restore my window locations when I reconnect my external monitor? Is it normal to still see what's on the screen when it's fully dimmed? How to turn off an external display without disconnecting? Does the “Put hard disks to sleep when possible.” option in macOS have any affect on SSD drives?